Hero worship has never played a part in my daily inspiration however there is one man who as an artist has changed music forever by exploring the boundaries of his art but even more incredibly, has seemingly found his creative stride past the age of 55. While most who people reach retirement age start slowing down and becoming one with their couch, Scott Walker was busy book ending malady with melody and perfecting his craft. Amazingly, his most recent work makes the Shining score sound more like a Bugs Bunny sound bed. In my world, that is a man worth bowing down to. 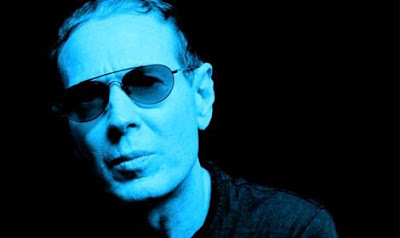 Shrouded in mystery and an air of cool since his early 20's, Scott Walker began making music in his early teens and has been producing music ever since. He went on to join the crooner trio The Walker Brothers, moved to the UK with the group, and become the first American to be seemingly more English than the Beatles. The Walker Brothers were blessed with wild popularity, many #1 singles over and reached a peak in the late '60s but the wear and tear of primitive touring conditions led to a near melt down for Scott. No longer interested in performing dated sounding pop music to the masses, Scott struck out on his own to produce solo records. These solo efforts dabbled in experimentation but were still not an epic stretch from the material he was making the Walker Brothers. It wasn't until '70s that Scott's new direction leaning towards contemporary classical and atonal meanderings began to really shine through. There was a brief reunion for the Walker Brothers (that hinted towards Scott's new found style) but once that ended '78, he began sculpting what would become his trademark style of the nightmarish place where chords meet dischord. Scott doesn't rush his art form so his fans have had to wait 11 years between each of his last 3 releases, rarely ever stepping out into the public eye. Each release is darker and more intense than the next and it is remarkable to me that this gentlemen who is the age of a traditional Grandfather figure is making music more threatening and terrifying, more experimental then people half his age. I am forever fascinated by Scott because of his remarkable creative transitions over the past 5 decades as well as his intense focus to create art that is 100% his vision. He doesn't revel in his past success nor does he have any interest in returning to life as a music industry puppet. Always moving forward, always forging out into new directions, I am thrilled to not only celebrate his varied catalog of releases tonight but also try to connect the dots over the years which brought him from Teen Idol to avant prince of darkness. Tonight from 7PM to 9PM, I will be tracing Scott's diverse musical career. This show won't be for everyone as his music progressed down a non traditional less musical path but fan or not, there is no denying his influence on music over the past half century and on artists like David Bowie to Radiohead.